The West of England NHS Genomic Medicine Centre (WEGMC), a partnership of NHS Trusts, universities, commissioners, research and health science networks (including the West of England AHSN), is one of 13 regional genomic medicine centres in England that have been set up to help the NHS gain a better understanding of the genetic causes of cancer and rare diseases. The WEGMC proudly celebrated its official launch with a recent event at North Bristol NHS Trust’s Southmead Hospital. Highlights from the event included a key note speech delivered by Professor Sue Hill, chief scientific officer at NHS England and important local updates on the project from key members of the WEGMC team. In July, the WEGMC achieved the major landmark of enrolling the first patients in the West of England region to take part in the project. The project has also made great progress by developing personalised clinic bookings for patients who are eligible to take part in the project, an initiative that has resulted in a 100% clinic attendance rate. Patients in Bristol are currently being recruited but the project will be extending to Bath, Gloucestershire and Weston in the near future. 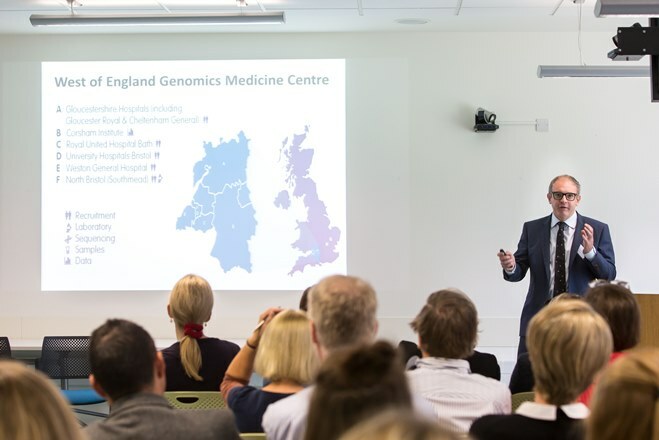 Genomic medicine centres are part of the wider 100,000 Genomes Project, which is a ground-breaking initiative launched by the Prime Minister in 2012. The project involves collecting and ‘decoding’ 100,000 human genomes, which are complete sets of people’s genes, in the hopes that new and more precise diagnostic tests and personalised treatments could be developed in the future. Bristol-based Joanna Cooper’s daughter Imogen, aged seven, has a rare condition caused by mutation in the KAT6A gene which was eventually diagnosed through a ‘diagnostic odyssey’ of tests. Find out more at www.wegmc.org.